Mr. Faler, the owner of Fluid & Reason, LLC, is an inventor, technology architect, designer, programmer, and engineer with 27 years of experience. He is the inventor of the patent-pending ConstantQTM thruster which uses laser pulses to drive instabilities in non-neutral plasma. Mr. Faler has 13 years of research in ion and plasma thrusters. To demonstrate the thruster, Mr. Faler is constructing a low-earth-orbit satellite which is scheduled to fly in mid-2016. He founded Cimulus, Inc. in 1992 before joining Fluid & Reason LLC and has participated in approximately 500 custom software and embedded hardware projects. Proficient in many computer languages, he has taught corporate training seminars and college courses on C++ threading, networking, and data structures. During his career, Mr. Faler has contributed to several of the US EPA models used for emission factor modeling, including MOVES and NMIM. His projects have been conducted for a variety of private and public clients, including EPA, and have included system architecture and design, distributed computing, simulations (agent and differential equations), GPU coding, embedded system coding and circuit design, teaching, and genetic programming. 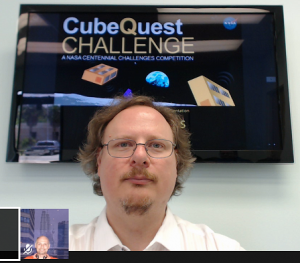 Mr. Faler is currently leading Team Miles, a 12 person team competing in the NASA Cube Quest challenge.